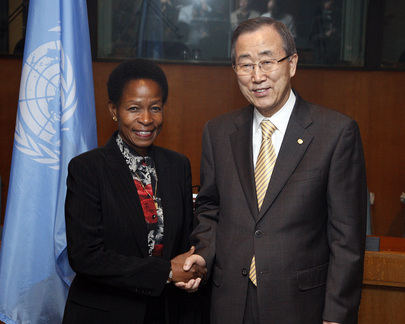 UNITED NATIONS, February 27 -- The UN's Ban Ki-moon, just as he travels through Africa, has quietly changed a rule allowing the removal of Tanzanian Anna Tibaijuka as head of the UN's Office in Nairobi and her replacement by a German, Achim Steiner. Secretary-General's Bulletin 2009/3, which was published on February 26 and which Inner City Press asked Ban's Deputy Spokesperson Marie Okabe about on February 27, changes a previous rule. Until now, "the Office [wa]s headed by a Director-General, at the Under-Secretary-General level, who is the most senior Under-Secretary-General among the Heads of the United Nations Programmes headquartered at the duty station, namely, UNEP and UN-Habitat." Thus, the Director-General of UNON was Anna Tibaijuka. She wrote the UN's report on Robert Mugabe's "Operation Take Out the Trash" in Zimbabwe, and finessed questions about the UN taking sides in the contested election in Kenya between Raila Odinga and Mwai Kibaki. She has strong support from the UN staff who work in the Nairobi duty station. Now, under the Bulletin Ban has just put out and that goes into effect on March 1, "the Office is headed by a Director-General, at the Under-Secretary-General level, designated by the Secretary-General from among the heads of United Nations programmes headquartered at the duty station, namely, UNEP and UN-Habitat." It is noted that following the recent ceremony in which Ban's Under Secretaries General signed "compacts" with him, Tibaijuka does not appear to have signed a compact to remain as head of UNON. Others note that Ban's USG for Management Angela Kane is German, as is Achim Steiner, who is privileged by Ban's quiet switch. This takes place against a backdrop in which Ban sought to eliminate the post of Special Advisor on Africa, a move opposed by the Group of 77 and China and the Africa Group. In the budget debate in December 2008, the General Assembly directed Ban to henceforth appoint a new Special Advisor on Africa, which he has yet to do. Ban's team has not explained either that move, nor this one. Some call it, diplomatically, tone-deaf, or surmise that Ban is badly advised. Inner City Press: in yesterday’s Journal there was an announcement in a new Secretary-General Bulletin about how the UN Office in Nairobi is organized. And it is my understanding that it actually would result in currently the most senior of HABITAT or UNEP is running the Office in Nairobi, and that the new policy the Secretary-General would get to choose between the two. Is that accurate and is it his intention to switch Nairobi from Ms. Tibaijuka to Mr. Achim Steiner? Deputy Spokesperson Okabe: If the Secretary-General’s Bulletin is what you read that’s all I have for you right now. Inner City Press: Well, what’s the rationale of changing the existing policy under which an African official runs the Africa office of the UN to a policy that would have it the other way? Deputy Spokesperson: I have nothing beyond what you read in the Bulletin.